Our family was hosted by Cavalia on Nashville's opening night. Here's our experience. 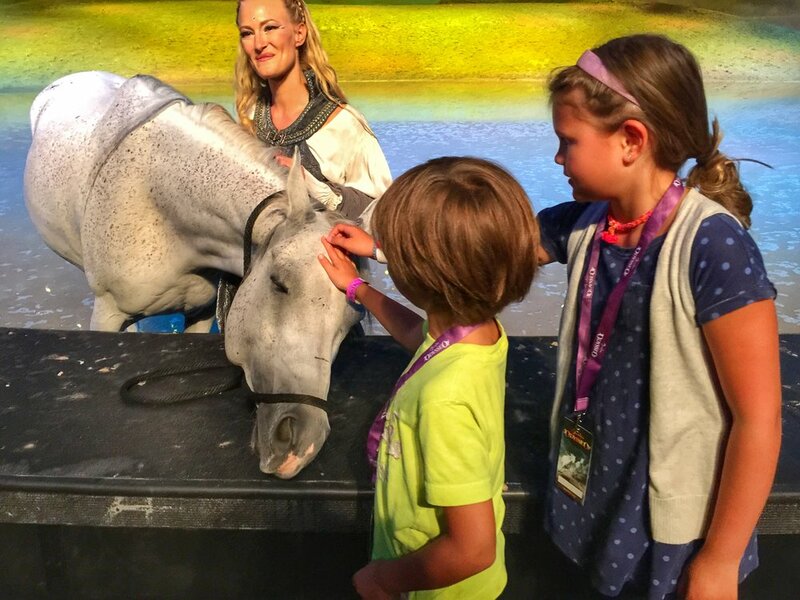 What the heck is Odysseo all about? That's the question we kept getting, especially after we visited the farm in Franklin, TN, where the horses were vacationing prior to the show. To give you an idea of the magnitude of Odysseo as a road show -- here are some astounding details. They have the biggest tent in the world. They've been doing shows all over the world NONSTOP for the past 6 years. 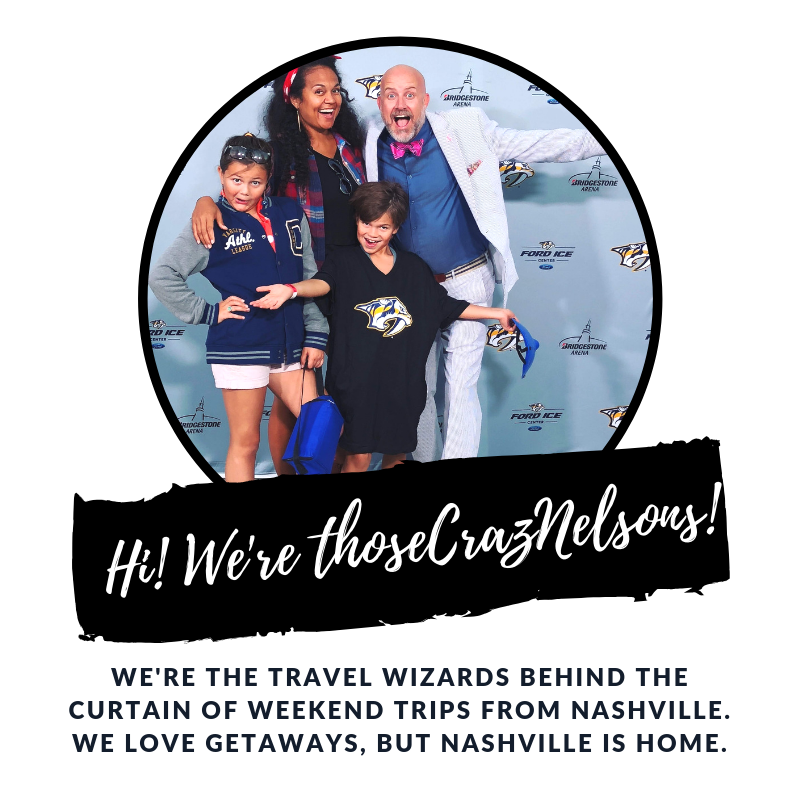 And when I say the show doesn't stop...sixteen days prior to opening night in Nashville, they were doing a show up in Canada. Where the Rolling Stones may tour with 50 semi-trucks, Odysseo has 120 trucks full of production materials. This does not include the 65 horses that are either flown or trucked to each show location. So, what's the show about? The show does not have a plot or story line. It is more of a dream-like production, a journey into another world, where acrobats, dancers, and horses are moving in unison. It is a variety of mesmerizing acts set to live music with an Italian maiden sweetly serenading the crowd the entire night. If you love live performances, horses, daring feats of bravery and strength -- absolutely. There were a few moments in the show when my heart leapt and I held my breath. At other times, I was just sitting there, entertained and lost in the movement. The performers made things look dangerously easy. During Act I, I actually thought that maybe I could stand up on a horse and ride it around a ring while it galloped!!? The performers made it look that easy. Then, I remembered that I almost fell off my horse in sheer terror on a guided trail ride when my horse started a slow trot-- and I quickly came back to reality. Are the horse tricks really that amazing? "Please, dear God, tell me there is more to this show." It wasn't until two horses decided that they wanted to play instead of perform that I realized how difficult it REALLY is to get a herd of horse to run, spin, and get in formation the way these horses were doing. They aren't robots. These geldings and stallions are actually performing, and it can go awry in a second--as it did during one number on opening night. It was so endearing, watching the 2-legged performers gently guide the frolicking horses back into performance mode. It was at that exact moment that my sense of awe was really established. The entire show has to be flexible to accommodate these animal actors. The live band has to adjust. The other horses have to re-calibrate. It is a beautiful synchrony to behold. These horses don't jump through open flames or dangle from trapeze bars by their hoofs. If you're hoping for that, you may want to temper your expectations. But, the things they do in each performance require skill and training of phenomenal proportions. My 7 and 8 year old kids ADORED the show. They were captivated the entire time. A little girl, around 2 years old, was behind me on her parent's lap. She sat through the entire show, cooing and cheering during every horse appearance! I'd say if your child is able to sit through a 2-hour movie, you can consider bringing him or her. The show is about 3 hours long with a half hour intermission midway. You can eat and drink during the performance. Here's what people were saying after the show. "I couldn't bend down to grab my drink; I was afraid to miss a thing." "No one will believe me when I tell them how good that show was." Here are your options for an affordable experience. Obstructed views of the stage are the least expensive tickets you can buy. I have heard from folks who have sat in those seats that it's not a bad view at all. The arena is small enough that every seat feels close to the stage. You can view what an obstructed view looks like prior to purchasing tickets. For the obstructed view of the show a family of four: 2 adults and 2 kids (under 12) would cost around $274, including parking and fees. When you consider a high-production show in Vegas, a concert, or a Broadway play, this is a reasonable amount of money for a family of four. Either way, it is an investment, so take only the kids in your family who are old enough to enjoy it, or make it a date night for adults only. Third party sites, like Groupon, have been known to offer tickets at the end of the show's run in other cities. People have said this was an inexpensive way to purchase tickets for the show. However, Nashville has been consistently selling out shows, and even extending show dates (as of today 9/5//17, the show will run until Oct. 1, 2017). I don't know if Groupon will be an option for the Nashville show, but you should definitely monitor the site for any late deals! Search for promo codes! We've got one that you can use: HORSE which gives 10% off of Gold tickets and 15% off of Rendez-vous VIP tickets. Kroger grocery stores are also offering discounts when you purchase $50 or more worth of groceries! 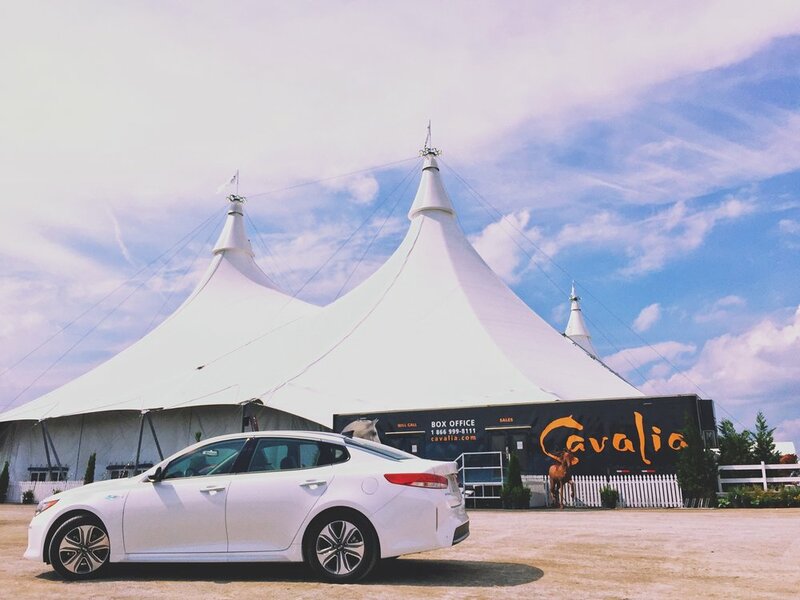 Cavalia offers a Rendez-vous VIP package, though. Full meal buffet dining served before the show. Great selection of various refreshments available at will. Dessert buffet, coffee and tea served during the intermission. Exclusive stable visit after the show. The VIP experience for a family of four: 2 adults and 2 kids (under 12) with no discounts would cost: $820, including parking and fees. See for yourself! 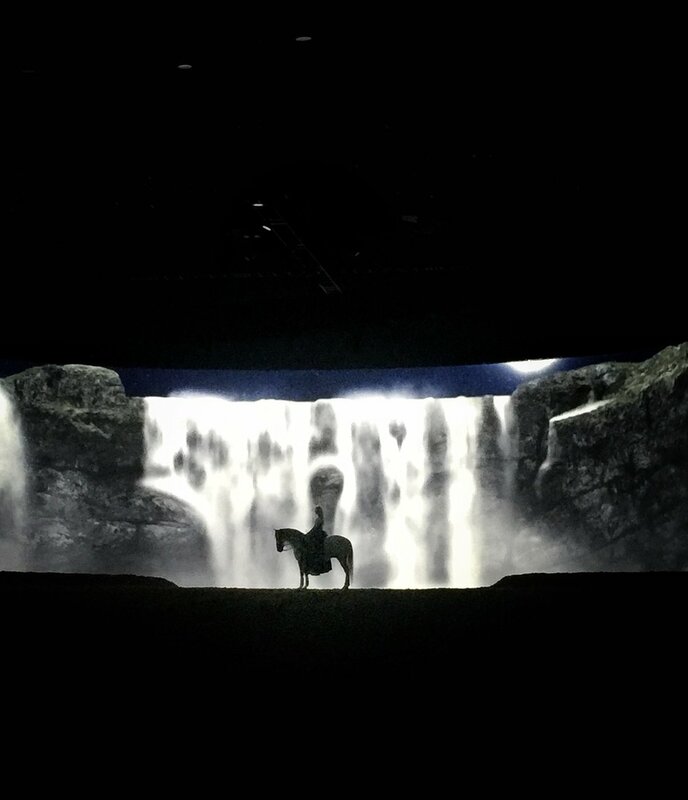 Enjoy a sneak peek of Odysseo! Beach this fall? You need to ask yourself these 5 questions first. Exclusive: What's so special about these 65 horses in Nashville?